I would like to begin by taking a moment to acknowledge the passing last week of Medea, a very remarkable cat who was the Queen for many years at Enchantments in NYC. 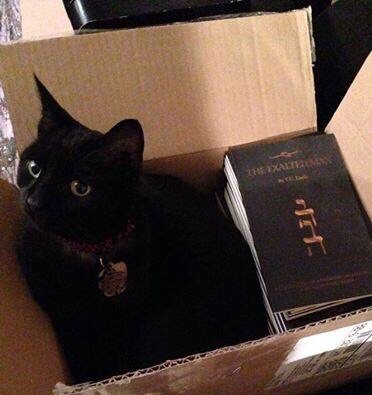 The picture that accompanies this week’s horoscopes is of Medea back in 2014 when she was doing an inventory on a case of my books that had just arrived from the publisher. My favorite memory of her is from one winter weekend back in the day when the heat went off in the store and I was forced to do my readings wearing an overcoat. During each appointment Medea lay curled up in my lap like my own personal heating pad, occasionally poking her head out from the folds of my open coat to meow at the client in apology for the cold room. What a Charmer she was. Aries- As Mars and Uranus in your sign line up with Venus and Jupiter to put stars in your eyes and pep in your step under a fiery Super Full Moon Eclipse in Leo, it will be a case of irresistible force meets immovable object, for at the same time Saturn and Pluto in your House of Career will be reminding you just how important it is to work hard and take care of business if you expect to attain all the success you’re imagining. Neptune behind the scenes should provide the right pinch of intuition as the Sun and Mercury in your House of Groups open the doors to a mixed audience of those who can help you as well as those who would feed off you. Make sure you’re listening to that wise little voice within when it tells you who’s an angel and who’s a vampire. Gemini- With Mars in your House of Groups aligning with Venus and Jupiter in your House of Relationships, your tendency now will be to believe that you can make just about anyone do your bidding, however, be careful. Saturn and Pluto in your House of Death and Transformation squaring Mars would indicate that there is more than enough opposition to what you’re thinking about doing to provide significant blowback if you push things too far. Neptune in your House of Public Image would further insinuate that you’re not fooling anyone but yourself if you think that people don’t suspect what you’re up to. Let’s hope the Sun and Mercury in your House of Philosophy can convince you to refrain from doing anything questionable, although chances are you won’t listen……Que sera sera. Cancer- You have so much creative energy bubbling under the surface now it’s a miracle you don’t explode, especially since you’re bottling it up by feeling hopeless about the possibilities in your life. Likely it’s Saturn and Pluto in your House of Open Enemies squaring Mars that has you feeling this way, however, Mars in your House of Career is also about ambition and as it aligns with Venus and Jupiter in your House of Work you currently possess enough luck, charm, and talent at this time to turn yourself around if you really want to. Try to let Neptune in your House of Philosophy open you to the wisdom of your Higher Self, while at the same time let the Sun and Mercury in your House of Transformation show you the way to move beyond your immediate confines so that you can start to approach that light at the end of the tunnel…..you do see it, don’t you? Leo- This week will begin with a Super Full Moon Lunar Eclipse in your sign so make sure you buckle your seat belt as it could be a very bumpy ride. With Mars transiting your House of Long Distance Affairs and aligning with both Venus and Jupiter in your House of Romance, you’ll probably be feeling like running off to the circus, however, try not to be so naïve. Saturn and Pluto in your House of Routines squaring Mars will be there to remind you that you already have a life and the responsibilities of it are not going anywhere. Neptune in your House of Shared Resources could have you overestimating just about everything, so instead of dreaming about running away, instead try to direct your imagination to something more viable, like a hobby or a moonlighting that could be more. Your escape to Oz might take longer that way, but then again you won’t have your responsibilities following you like a wolf pack that smells blood. Think about it. Virgo- Have you thought much recently about how in synch with your circumstances you are? You’re ready to change and so is your environment; with that in mind, what are you waiting for? Saturn and Pluto in your House of Creativity may seem to be coming up with a lot of reasons why you can’t do something, but look at it this way, if you can think of the difficulties that await, then you can probably solve them. Neptune in your House of Partnerships might suggest you ask (or meditate) for some help, especially if you have something that someone else needs. The beginning of a beautiful friendship (as Bogey would say) might be just around the corner, especially with the Sun and Mercury passing through your House of Daily Routines and increasing the foot traffic to your little corner of the world. Keep your eyes open! Libra- This week could be a mixed bag for you. There is certainly some great stuff going on, for instance, Venus conjunct Jupiter in your House of Communications aligning beautifully with Mars in your House of Partnerships likely means that good news and lucky connections are on the horizon. On the other hand, Neptune is squaring Venus and Jupiter so don’t overestimate how far your luck will go. There may still be a period of waiting and struggling in store for you despite the fact that you’ve been given a chance. Saturn moving across the bottom of your chart may be able to turn some of Neptune’s mysterious fog into creativity, although because it’s Saturn we’re back to the waiting and struggle. In the Blue’s they call this kind of mixed bag “payin’ dues” and all the best ones have to do it, so don’t complain, you’re in pretty good company. Scorpio- If you’re feeling it this week (and I know you are) how’s about sharing it with the rest of us civilians who haven’t got a clue? Venus and Jupiter in your House of Self Worth are aligning with Mars and putting a rocket in your pocket, just be careful that a square of this pair to Neptune in your House of Fun doesn’t cause you to be brought down by some sad sack you mistakenly think you can help. Saturn and Pluto in your House of Communications should enable you to “give it straight” to someone who’s a flat waste of your time, thereby saving your energy for some more meaningful pursuits, such as connecting with a special someone this week’s Super Moon may just cause to parachute into your life from parts unknown (heaven perhaps?). Keep us posted. Sagittarius- Saturn in your House of Self Worth and Neptune in your home area have been keeping you pretty well tethered for a while now, so maybe it’s time to be swept away by a Venus/Jupiter party on the outskirts of town where all the wild kids go to play? Mars will be there too, so you know it’ll be a real jungle gym of a venue with everybody bustin’ a move for shits and giggles. You deserve some of that action, don’t you? For God’s sake don’t think about it, just follow the directions the Super Full Moon will be sending out at the beginning of the week via your usual boredom alert and then be there or be square. Aquarius- If there’s someone who “makes you wanna shout!” then by all means let them know about it as the Super Full Moon Lunar Eclipse goes off like a roman candle to start the week in your House of Relationships. Hell, bring along a guitar if you’d like, or even your own spackle bucket to drum on. You’re positively bursting with charisma at this time so it’s all good. Saturn behind the scenes may make you feel a little shy (for like a minute) but gentle Neptune in your House of Self Worth will cajole you up there on the stage and then, watch out! As the Moon finishes the week in your House of Public Image any inhibitions you might have been feeling about expressing your heart’s desire will be long gone and then you’ll know……A Star is Born. Pisces- If there is anything you really want (or need) at this time just keep a smile on your face and you’ll probably get it. Venus and Jupiter are in your House of Public Image so you are positively sparkling now, plus with Mars in your House of Self Worth the Force is also with you. Even curmudgeonly old Mr. Saturn is winking, but that’s probably because Neptune in your sign is making him remember what is was like once to be young and without a care and well, even old Mr. Saturn can get sentimental. With all this good luck it would be very easy to get caught up and feel like you’re invulnerable, although the Sun and Mercury behind the scenes in universalist Aquarius will help to keep you humble, thereby making you a harmonious package of desire and holistic awareness. Namaste.